Uruguay’s capital city, Montevideo, is surprisingly easy to navigate. The city shoulders the coastline of the Rio de la Plata, and a 14 mile long stretch of waterfront (known as La Rambla) connects six neighborhoods of interest to gay travelers: Ciudad Vieja, Centro, Palermo, Punta Carretas, Parque Rodo, and Playa Pocitos. The following is a short list of gay-friendly places to stay with easy access to museums, restaurants, and nightlife. Contrary to the stereotype of homophobic machismo, Uruguay is famous for its live-and-let-live attitudes. Expect a warm welcome at the front desk of any of the places listed below. Intimate guesthouse situated in a 1930s Art-deco building offers modern rooms and individual kitchens. Stylish and spacious, The Esplendor is well designed with luxury amenities. (The Esplendor’s gorgeous rooftop view is shown at the photo above.) Using our Google Map of gay Montevideo, you will see the hotel is within walking distance of many nightspots and tourist attractions. Surprisingly, the rates are consistently low. Click below to view photos and get more info on the Esplendor. Great inexpensive option near many of the city’s museums that you could use as your base of operations as you explore Montevideo’s rich history. Try to snag one of the rooms with a view of Rio de la Plata for an extra-special stay! Simple gay owned-and-operated guest house. Staying at La Puerta is great for those on a budget who would like to stay with friendly helpful guests who are full of insider tips. 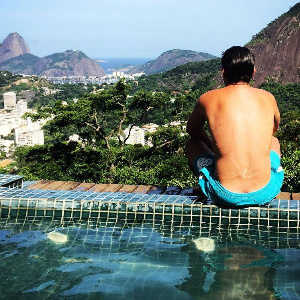 The gay alternative to AirBnB is now available in Latin America! Click below to browse gay-hosted apartments across Montevideo. 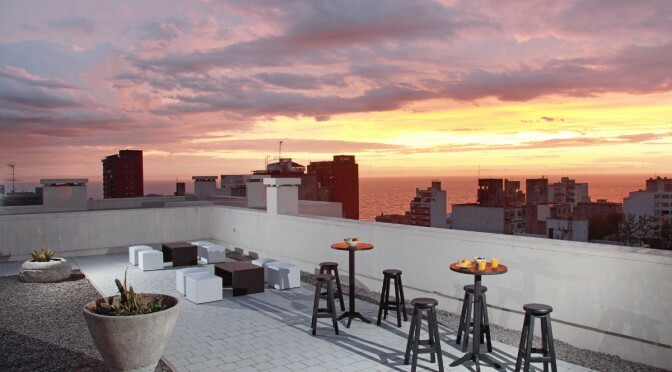 Ranked as one of the top five hotels in Montevideo, My Suites is a jewel of a hotel located on gay-friendly Pocitos beach. The hotel’s bar is a destination for wine aficionados and is one of the main attractions of the hotel. Click below to view photos and learn more about My Suites. Five-star luxury in the heart of Montevideo. This is the place for wealthy visitors looking for a flawless stay within walking distance of many of Montevideo’s gay and cultural attractions. Over in the Punta Carretas section, the other five-star option is the Sheraton Montevideo. Some travelers’ have reported that the neighboring Dazzler Montevideo is a close 2nd choice for a luxury stay in Punta Carretas. Not to be confused with the stylishly modern Esplendor, the Splendido is a low-cost option in the old city center directly across the street. The Splendido is a cheap hotel, but its reviews are very good. Reviews are excellent for this bed-and-breakfast where guests really would like to spend “one more night.” They have a fireplace, a terrace, and many other charming amenities.